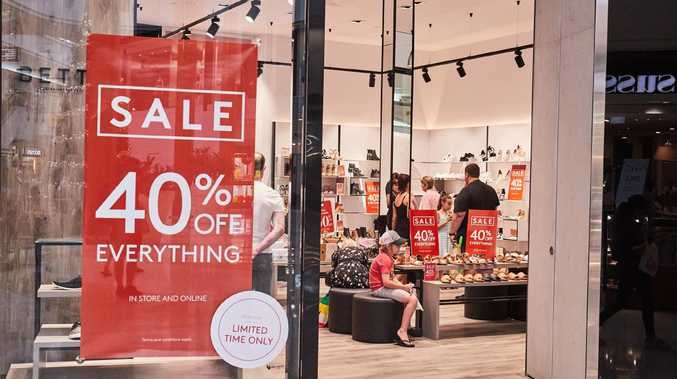 New research has revealed 10 million Aussies will shop the Boxing Day sales this year - and will drop a staggering $3.2 billion dollars on the day. The data, revealed by comparison site finder.com.au, found a huge percentage of us were preparing to shop during the Boxing Day sale period. But finder.com.au money expert Bessie Hassan said it was important to do your research before heading out for some retail therapy. "If you plan on shopping in store, make sure you also compare prices online. Although you won't have it right then and there, the wait might be worth the savings," she said. "Whether you're shopping online or in store, one thing remains the same - the earlier you get in, the better savings there are to be had. "Some retailers, like Forever New, are already running sales in the lead-up to Christmas. Jump online to grab yourself a last-minute Christmas or New Year's dress." Ms Hassan said some of the best deals included 30 per cent off selected Estee Lauder skincare, makeup and fragrance sets and 30 per cent off Clinique holiday sets. Jurlique is offering 50 per cent off selected items and 20 per cent off Christmas gift sets, while Forever New's sale, which is already up and running, includes up to 50 per cent off items both online and in store. And JBL will also offer a 26 per cent reduction on full-priced headphones for Boxing Day. "If you want to pre-plan your purchases check out finder.com.au's roundup of online Boxing Day deals in the days leading up to the sale," Ms Hassan said. Here's a roundup of some other huge Boxing Day deals. Myer retail operations director Tony Sutton said the Myer Sale, which starts instore on Boxing Day, was the company's biggest trading day of the year with over two million customers expected to visit a Myer store on opening day and approximately 20 million across the Myer Sale period. "It's an Australian tradition that many families and friends enjoy each Boxing Day and our customers have plenty of time to shop with extended trade across our stores," he said. "Always plan ahead by preparing a list of what you would like to buy or have a look at and determine a budget. "Wear comfortable shoes and take a shopping buddy to offer advice and help carry your bags." There will be savings of up to 70 per cent off a huge range of leading brands and products across all departments as well as special one day offers available on Boxing Day only including 20 per cent off MAC, 30 per cent off all children's shoes, 40 per cent off suitcases from Samsonite and Antler and 50 per cent off manchester, cookware and dinnerware. The online fashion powerhouse is offering up to 50 per cent off during the sale, plus 20 per cent off selected full-priced styles. Kogan's Boxing Day sale kicks off after Christmas and will end at 11.59pm on December 31. There will be more than 1000 deals across some of Australia's favourite brands and most sought-after products including Samsung, Microsoft, Dyson and Kogan. Top Boxing Day deals from Kogan.com include a Kogan 55-inch Smart HDR 4K LED TV with a special price of $499, a Dyson V6 Slim Vacuum Cleaner for just $279 and Nokia 8 (64GB) for $399. Catch Group CEO Nati Harpaz said there would be a slew of deals on offer. "On top of our incredible existing deals we are going to have a huge Boxing Day sale with 50-90 per cent off selected products," he said. "It will span across beauty, sports, homewares, fashion, footwear, tech, toys, groceries, health, pets and even more categories." Discounts and coupons website TheBargainAvenue.com.au insider sales for Christmas and Boxing Day include $15 off Peter Alexander PJs, 10 per cent off every purchase over $49 at Cudo and $50 off any wine purchase over $120 at Cellarmasters. The David Jones Clearance is on now - and shoppers can save up to 50 per cent on a range of fashion, shoes, accessories, homewares, manchester, electrical appliances and more. The makeup giant is holding an end of season sale with 30 per cent off selected items using the code 30OFF. There is currently 40 per cent off everything at Bonds. Sign up to the Bonds & Me online mailing list to hear about Boxing Day best buys. This year Rebel's sales will start online on Christmas Day, and all Rebel stores will be open on Boxing Day for the first time. Deals include 30 per cent off all clothing for men, women and kids, up to 50 per cent off a range of footwear including Nike, Adidas, Asics, Under Armour, New Balance and more, 40 per cent off all body boards, surfboards and inflatables and 30 per cent off all bikes and scooters. There will be up to 50 per cent off more than 7000 items during the online homewares and furniture favourite's Boxing Day sale, which ends at 11.59pm on December 26. There will also be up to 40 per cent off 25,000 items of furniture and homewares from now until January 5. Save up to 30 per cent off books including bestsellers during the End of Year Sale. ASOS's Boxing Day sale includes up to 50 per cent off select items and is available for all countries that ASOS ships to. The stationery chain has up to 50 per cent off selected styles from now until Boxing Day.